Of the varied inhabitants of this melting pot place. My heart is definitely for the natural world. Take me out into the countryside, into a woodland, or along the shoreline and I am content. I have never considered myself a city girl until I was introduced to Vienna. “Oh Vienna!” that hunting bleak phrase from the famous song by Ultravox is in complete contrast to how I would express my feelings. Imagine the words “Oh Vienna’” said with a warm, nostalgic memory and you would understand what this city has come to mean. This day, like most days, I start at Schottentor. Schottentor is a transport hub where lots of trams bring their passengers in from the outlying districts of the city; buses and the Ubahn connect here too. I head down Schottengasse towards Freyung, which is a beautiful square. At Christmas and at Easter there are lovely markets here. Today, I decide to head along Herrengasse all the way to the Hofburg Palace. 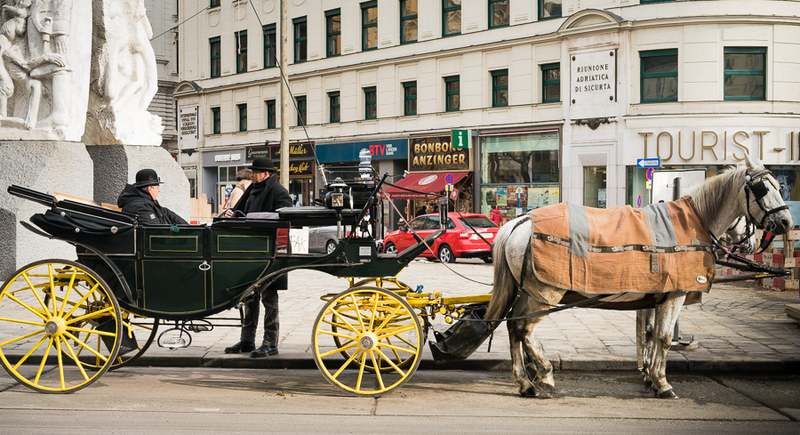 This walk always lets me know I really am in Vienna when I hear the sound of horses’ hooves pulling their elegant landaus along the street. Throw in a musician, perhaps a musician busking close to Café Central, or the harpist playing in the Ferstel Passage, and I am captivated. From here there is a myriad of choices; grand open streets lined with designer shops and attendant security; alleyways that lead into small courtyards, imposing cathedrals, bustling coffee shops. My choice is to carry on to the Albertina, a museum and art gallery in which I have wandered many times, usually on sweltering summer days as a respite from the heat! It is in good company with the Opera House, Burggarten and the Hotel Sacher close by. I have never yet had a Sacher Torte, and it is something I must remedy. To complete my wander, I head out the Ringstrasse and find a tram that will take me to the U4 and then home. My city walk is complete, but tomorrow I might just try a different way! Must join you on one of these walks…. Must join you on one of these walks one day!! !